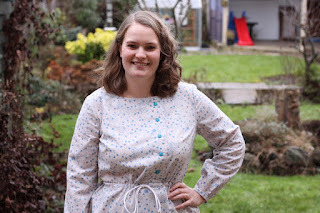 I have had my eye on the Mayberry Dress from Jennifer Lauren Handmade since it was released, but as I was pregnant at the time I waited until I had had my baby before tackling it! The instructions were amazing, I was very impressed with how thorough they were and how clear the diagrams were. Even though there are some slightly more advanced techniques in the pattern, the instructions are so clear that I think a beginner could tackle them. These are the best set in sleeves I've ever done! The instructions clearly explain which PDF pages need printing for each cup size option and sleeve length, meaning that you don’t waste paper printing pattern pieces that aren’t needed. I particularly love the different cup size options. The pattern comes with 4 different bodice front pieces for each side, which minimises the need to do any bust adjustments and means you are more likely to get a better fit straight out of the pack. This is actually the first time I’ve used an independent pattern company that provides different cup sizes and I’m very impressed with the fit. The fabric I used wasn't ideal, it was a quilting weight cotton and it's actually a bit stiff for this project. The tie waist feature and gathered sleeve cuff would work better in something a little more fluid. I've got some lovely, fine chambray that I'm going to use for my next one. It’s also a fabric design that I loved when I ordered it, but don’t actually think the colour suits me. 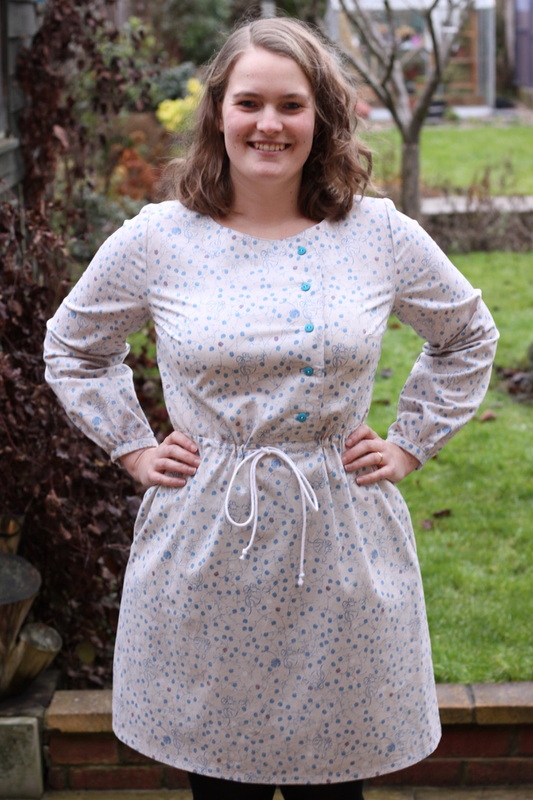 I love the dress so much I’ve still been wearing it loads though! I didn't make any alterations to this pattern. The cup sizes mean the fit was pretty close without making any adjustments. The tie waist also allows some adjustments once you are wearing it. The only thing I will change next time is to lengthen the skirt a couple of inches, it's just a personal preference but I would be more comfortable if it sat at my knees. I'm 5'8 for reference, so lengthening things is a common adjustment for me. I am planning a lot more of these. It's a great dress for the winter with long sleeves, as I don't have many. I also think the style is perfect for anything smart-casual. I could wear this to work easily as well as at the weekends, it's so easy and comfortable. 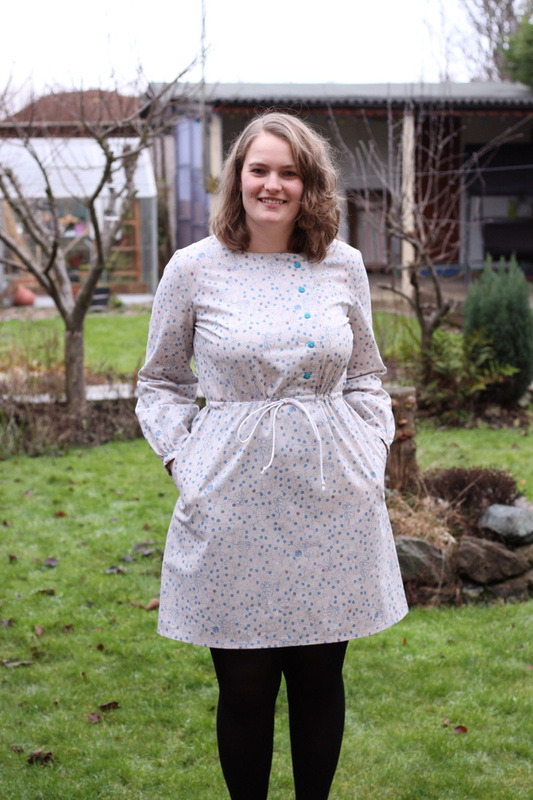 The other element of this dress that I wanted to review is its suitability for nursing and post-partum mums. 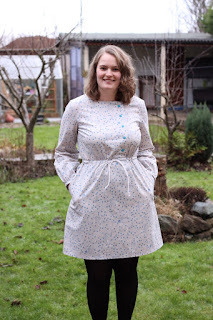 Even when I was pregnant I thought it would be a great post-baby dress. I was right! The drawstring waist means it can be adjusted as your tummy shrinks down and is really flattering. 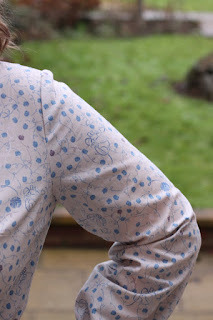 I was desperate to get out of maternity clothes and wear something with a waist, but didn't want to sew anything with a fixed waistband whilst my figure was still changing. 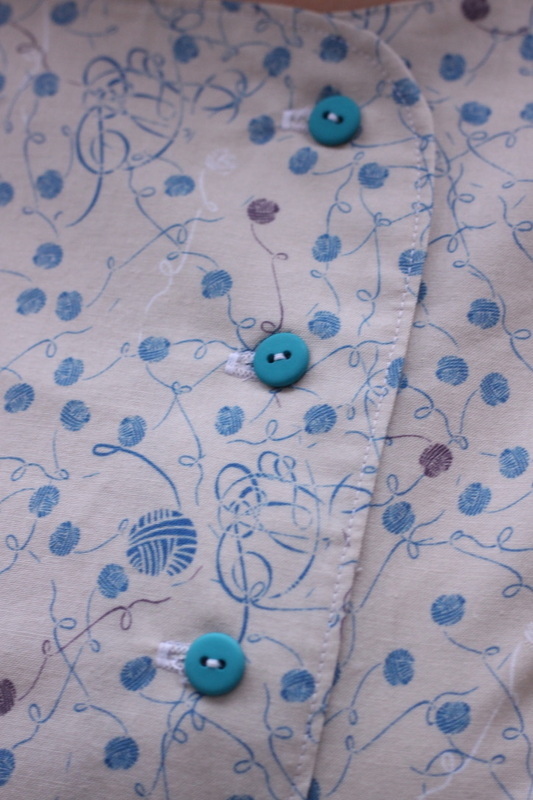 The other great thing is the button front, which allows access for breastfeeding. As it's asymmetrical, one side is easier than the other but it still works well. For easier and quicker access you could replace the buttons for snaps. 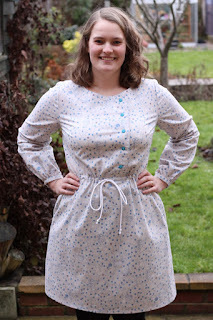 Overall I love this dress pattern and would recommend it to everyone! I'm looking forward to making a lot more, at least one for each season!